I think you offer an awesome product, especially since the ingredients are naturally occurring. Yes, I do find your product beneficial. As it stands, I think you offer an awesome product, especially since the ingredients are naturally occurring. As someone who doesn’t even like to take Tylenol, this is important to me. I also love that on top of the PL you also include things like astaxanthin…I notice this year my pigmentation spots aren’t nearly as bad as normal, and the only difference is your capsule. I did the clinical research before buying the product myself, and it all points to moderate protection which is great when you are a lily-white Brit like me living in Southern California because every little bit helps! I have and will remain telling my friends about the product, it is literally revolutionary. Since using this product, within the first 2 weeks I had more evenly toned skin. I have and will remain telling my friends about the product, it is literally revolutionary. I couldn’t believe how fast it started working; my body metabolizes vitamins and minerals very quickly so I think that helped a great lot. Whether traveling, gardening, or exercising outdoors, I will always be certain to have Sunsafe Rx on hand. I have a bottle of this in my bathroom and take 1 pill before swimming or surfing. It is made from natural ingredients from foods and plants so it’s nutritious for your whole body. It helps support your skin during exposure to the environment, it is anti-aging, and it helps diminish the appearance of wrinkles and pigmentation spots. I have been amazed at how it protects my skin. When I am doing athletic events and sweat profusely, I don’t have to worry about my skin protection washing off. I was skeptical before using the product, and it ended up working better than I could have imagined…With these pills, I was well supported. I bought Sunsafe Rx because I had trips coming up to Hawaii and Brazil. It turned out to be the best thing I brought, and I continue to use it on a regular basis here in Los Angeles. I take it before surfing or any other daytime activity or even if I’m just walking around outside. I was skeptical before using the product, and it ended up working better than I could have imagined. With these pills I was well supported, and sometimes I was in the water all day long. 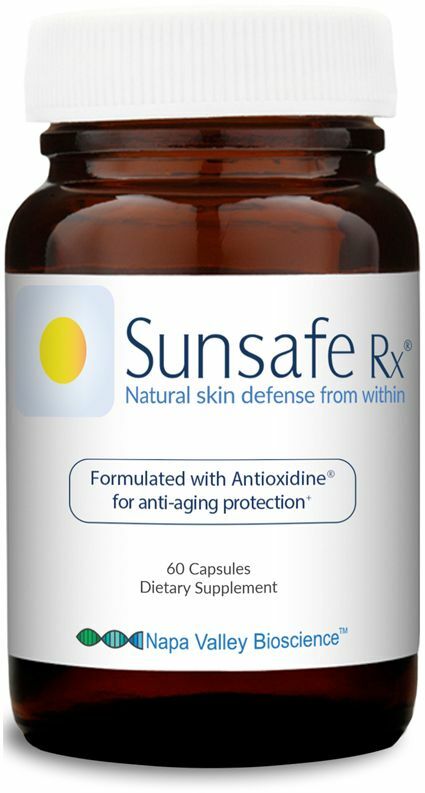 The healthy, natural ingredients were the first thing I noticed, and now I have firsthand experience of the anti-aging benefits and the fact that Sunsafe Rx contributes to promoting your defenses against the effects of exposure, the antioxidants in it are good for your skin and eyes, its ease of use, and the full-body support Sunsafe Rx provides. It supports my skin at all times. Unique product with an impressive list of ingredients…This is the answer! Not sure how but it just works. *Disclaimer: Results may vary from person to person. Sunlight can still be harmful. This product is not intended to replace topical sunscreen or other methods of sun protection.